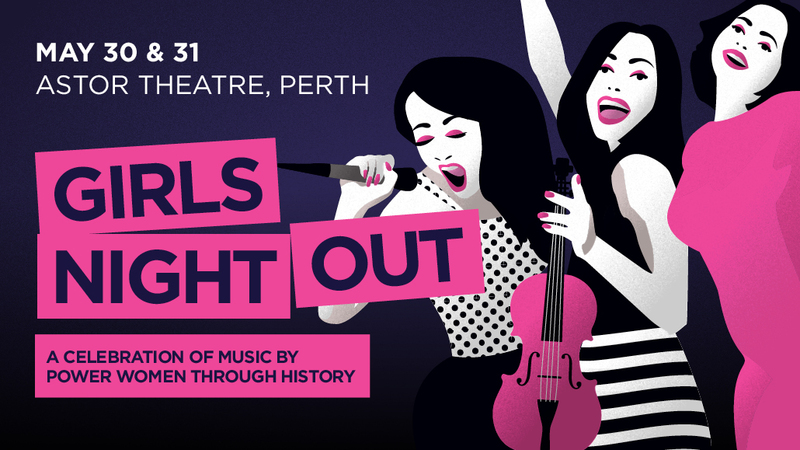 Perth Symphony Orchestra | Girls Night Out! What better way to celebrate #InternationalWomensDay than with the news that due to overwhelming popular demand, a second Girls Night Out show on Friday, May 31 has been announced at Astor Theatre Perth in Mount Lawley. Sisters are doing it for themselves! Groups 6+ (A res): $90*^ which includes a glass of bubbles per person in a private pre-show area! Pairing Perth Symphony Orchestra with WA’s foremost powerhouse singers, we are excited to announce the talent for the night. Joining world respected conductor Jessica Gethin – Conductor, will be the incredible voices of Rose Parker and Sophie Foster, with soul sister and star of Hot Brown Honey, Odette Mercy of Odette Mercy & Her Soul Atomics. Plus, another woman who has proven a hit on stages both musical and theatrical, Lucy Peach joins Girls Night Out. A folk singer who isn’t afraid to tackle the big issues, Peach has just enjoyed another successful season with her groundbreaking show My Greatest Period Ever. Featuring fully orchestrated versions of Beyoncé, Tina Turner, Madonna, Adele, Aretha Franklin, Nina Simone and so many more like you’ve never heard them before, Girls Night Out is a celebration of women, by women, for everyone. It is the latest in PSO’s ‘The Music Of…’ series at the Astor Theatre that has so far seen us tackle the likes of George Michael, Aretha Franklin and Stevie Wonder. Plus ALL of the charts, arrangements and compositions are written by local women, with the incredible talents of Kathy Potter, Cara Zydor Fesjian, and Stephanie Nicholls confirmed to write the scores. In addition we are excited to announce even more powerhouse voices with Alana-Fay, Mia Matthiessen and Chelsea Cullen joining the 25-strong orchestra and lead singers as backing vocalists for the shows. Plus ALL of the instruments on the night, from strings right through to drums and bass, will be performed by what we believe is the first entirely female orchestra ever in Perth. You will likely never have seen this many incredible women in the one place before! With many emotion-charged stories emerging as part of the #metoo and #timesup movements, celebrating women’s achievements is equally important. So many of the world’s greatest role models over the past century have been singers and musicians, and Girls Night Out is about keeping celebration and inspiration in focus as a part of that conversation.